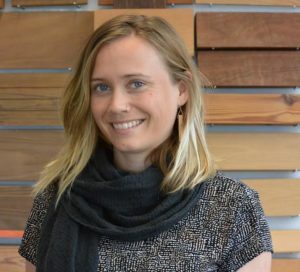 Nelle’s career as a landscape architect began in San Francisco working as an urban permaculturalist where she developed an interest in community engagement and ecological planning and design. To complement her hands-on experience on the farm running volunteer work days, DIY workshops, and community events, she then attended the Conway School. For Nelle, the Conway School not only helped to bridge gaps in her background through deepening her understanding of the design process and the bigger context, but it also led her to discover the profession of landscape architecture. Nelle got a fully-funded Teaching-Assistant/Associate position at University of Massachusetts Amherst to obtain a Master of Landscape Architecture degree immediately after graduating from Conway. At UMass, Nelle taught Landscape Ecology and Landscape Contracting for two years each. Her academic career emphasized ecosystem service-based planning and design in the public realm. Nelle developed a Sustainable SITES Initiative guided planning and design project as her master’s project capstone. Nelle’s affinity towards work in the public realm brought her to RBA Group in Philadelphia, where she helped to manage a term agreement with the City’s Department of Public Property to renovate a series of public parks. In 2017, Nelle joined Studio Bryan Hanes, a small design firm in Philadelphia, in hopes of deepening her experience with ecological urbanism, placemaking, and community engagement. Studio Bryan Hanes strives to create places that enrich human experience and express artful celebration of the everyday. The studio’s work draws inspiration from the dynamic processes of nature while engaging the complex social issues of the urban contexts. In winter 2019, Nelle started working with the Pennsylvania Horticultural Society (PHS) as an Urban Design Project Manager. PHS Urban Design partners with city agencies, non-profits and community groups to accomplish its work. As part of the Neighborhood Parks Stewardship Initiative, PHS is working with Philadelphia Parks & Recreation, the Fairmount Park Conservancy, and Philadelphia Water, to reconnect Philadelphians to the city’s robust public park network. PHS landscape architects are renovating six city parks to both update the site amenities and improve sustainability. These range from the 40-acre Wissinoming Park to the modestly scaled quarter-acre Weccacoe Playground in Queen Village. Outside of the office Nelle is a musician, rock climber, and Muay Thai practitioner.